Walter Gerard’s first bike was a black singlespeed purchased from Montgomery Ward with his own carefully saved money. The singlespeed was replaced by an internally-geared, three-speed Schwinn shortly after. In 1963, during a bike tour with his family in southern England, Walt became enamored with the derailleur gearing he saw on European racing bikes. Upon returning home he purchased a 10-speed Western Auto brand bicycle, despite his mother’s objections that the exposed gearing would be vulnerable to damage and wear. A few years later his family was planning a second bike tour in Britain, and they ordered handmade, Carlton brand bicycles with external derailleur gearing in preparation. During the 69 days of this second tour, Walt spent hours in British bikes shops asking questions and learning from experienced mechanics. One of Walt's instructors was Jack Hearne, the professional mechanic for the England team during the Tour of Britain. Walt’s passion for bicycles had become fully fledged, and he bought a lightweight Peugeot PX-10 with “sew up” tires shortly after he returned to school in the fall. In 1966, Walt and other local cyclists formed the Boone’s Lick Bicycle Club. The club planned rides and bicycle tours, at least once taking the train from Wabash Station on Tenth Street to Centralia so they could cycle back to Columbia. The group began to lust after parts and accessories that weren’t available in Columbia at that time—there was a demand for water bottle cages, touring racks, and cycling gloves, as well as the lightweight bicycles commonly found in Europe but not readily available in the United States. Ed Morton, a Springfield, MO bicycle dealer, suggested Walt begin selling imported bikes and bicycle parts in Columbia. After some bargaining with his parents, a young Walt rented a vacant barber shop on Hickman Avenue and Walt’s Bike Shop was born. Cycling’s “golden age” had begun in the United States, and Walt’s business boomed. 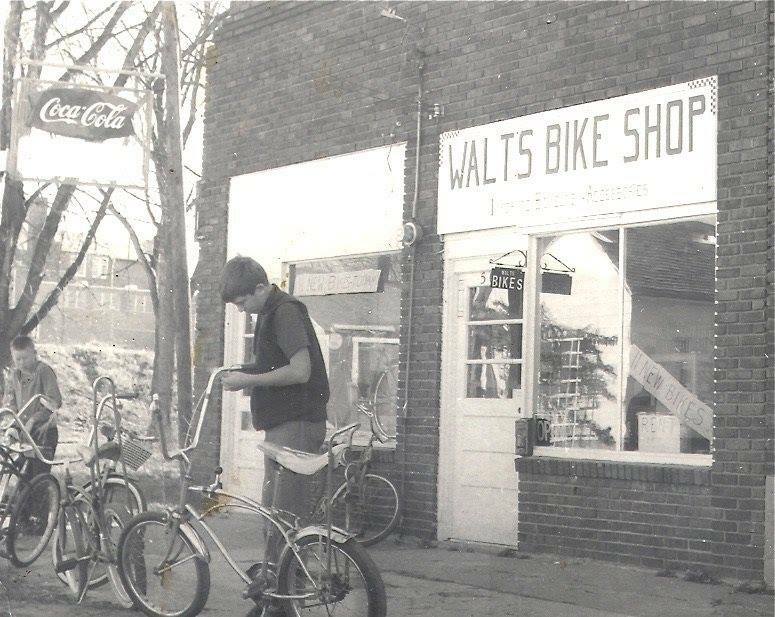 Years later, in 1981, Walt Gerard sold Walt’s Bike Shop to Frank Morris, a PhD candidate who learned a love for cycling through commuting, cycling with the Boone’s Lick Bicycle Club, and a class on bicycle mechanics taught by Walt. Frank shares Walt’s belief in the importance of great customer service, strong cycling community, and dedicated staff. Frank and the Walt’s team introduced the Lifetime Free Labor Policy in the 1988. The Lifetime Free Labor Policy guarantees Walt’s customers peace of mind and is a testament to our commitment to the bicycles we sell. In 1994 Walt’s Bike Shop moved a half block up Rogers Street to our current location, which originally housed the A&F Super grocery store. Moving into a larger space afforded the opportunity to expand the business. In 1998 the camping and outdoor section of the store was added, and in 2004 the fitness department was added to the eastern side of the shop. Walt’s Bike Shop had become Walt’s Bicycle, Fitness, and Wilderness Co.